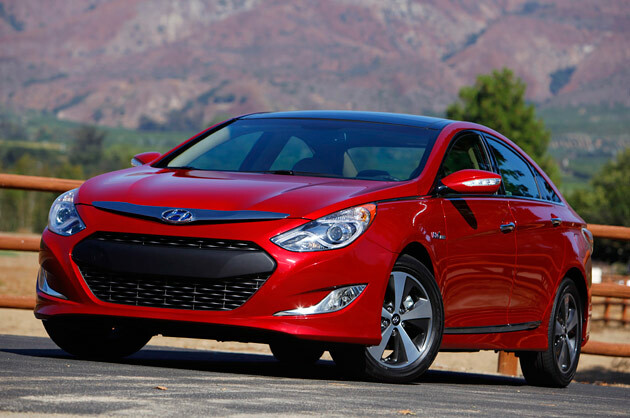 Hyundai has rolled out its second-generation 2016 Sonata Hybrid sedan. The Sonata Hybrid continues to visually differentiate itself from other Sonata models with purposefully unique wheels and front and rear fascia that improve aerodynamics while highlighting Sonata Hybrid’s advanced technology and efficiency. To be offered in Sonata Hybrid and Sonata Hybrid Limited models, the exterior design is enhanced by a series of functional changes to the front and rear fascia that highlights its efficiency and the advanced technology below the surface. These visual changes also lower the coefficient of drag to an exceptionally low 0.24; the lowest in its class. Visual changes to the Sonata Hybrid’s exterior include a unique larger grille, front and rear bumpers, front fenders, front and rear lights, chrome side sill moldings, Hybrid badging and new eco-spoke alloy wheel designs. The heart of the 2016 Sonata Hybrid is a downsized 2.0L Nu GDI four-cylinder gasoline engine joined to a six-speed automatic transmission combined with a powerful 38 kW electric motor and clutch. Located in place of a traditional torque converter, Sonata Hybrid’s Transmission-Mounted Electrical Device (TMED) delivers the same responsive, engaging driving characteristics Sonata owners expect while improving fuel economy through the use of the larger electric motor. It is possible for Sonata Hybrid to operate solely on electric power at speeds up to 75 mph by decoupling the gasoline engine from the rest of the drivetrain. The Sonata Hybrid is equipped with a lithium-polymer battery pack with a capacity of 1.62 kWh, which is a 13 percent improvement. The battery pack now fits under the trunk floor, allowing for a flat trunk floor and available 60/40 split-folding rear seats. Inside the passenger cabin, a distinctive instrument cluster with a 4.2-inch color LCD multi-purpose display provides Hybrid drivers with additional information about the hybrid system’s operation. Hyundai engineers also implemented many active safety technologies to assist drivers and help prevent accidents. No longer reserved for luxury cars, advanced safety technologies such as Forward Collision Warning, Blind Spot Detection with Rear Cross Traffic Alert, Lane Change Assist and a Lane Departure Warning System are all available in this midsize sedan. The Sonata Hybrid delivers the convenient technology one would expect in a luxury vehicle in an incredibly efficient mid-size hybrid sedan. Hyundai’s hands-free Smart Trunk is now available on the Hybrid as well as an electronic parking brake with automatic vehicle hold, a driver memory seat, rear window sunshades, heated steering wheel, LED interior lights, ventilated front seats, power front seats with four-way adjustable driver lumbar and Smart Cruise Control featuring full stop capability. The 2016 Sonata Hybrid comes standard with seven airbags, including a new driver’s knee airbag. Electronic Stability Control, Vehicle Stability Management, Traction Control, ABS and a Tire Pressure Monitoring System with individual tire pressure display and a rearview camera are also standard. Projector headlamps are standard while HID headlamps are available. Engine: 2.0L gasoline four-cylinder – 154 hp at 6,000 rpm and 140 lbs-ft of torque at 5,000 rpm; electric motor – 51 hp (38kW) at 1,770 – 2,000 rpm and 151 lbs-ft of torque at 0-1,770 rpm; Lithium polymer battery – 56kW. Transmission: six-speed automatic with SHIFTRONIC manual shift mode.